There are few things I enjoy more than spending a little time with one of the most interesting and useful tools the world has to offer: a good revolver. Whether it's for self defense, hunting, plinking or collecting, it's tough to beat a wheelgun. Recently, I've had the opportunity to spend some time with the Taurus Tracker 992, and have found it to be a nifty piece of machinery. I've long touted .22 revolvers. They're great for economical practice and small game hunting, plus they're just a heck of a lot of fun to shoot. Taurus has done very well with its line of Tracker revolvers in centerfire, and for good reason. The Tracker was conceived as a revolver to be carried in the field, and the new 992's big brothers have proven themselves to be up for that job. The Taurus Tracker 992 is no different. The great thing about this new Taurus? It converts from nine-shot .22 LR to a nine-shot .22 Magnum in a matter of seconds. 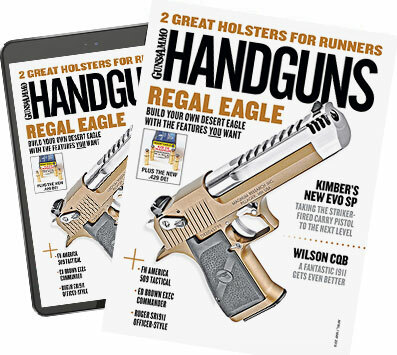 It's no secret that Taurus has offered various rimfire calibers in the Tracker, including the seven-shot .22 LR and the seven-shot .22 Magnum versions, but the 992 combines the two—giving shooters a really flexible and affordable revolver with two extra shots in the cylinder. Taurus engineered the exchangeable cylinder feature in an interesting fashion. The revolver is fitted with a button on the right side of the frame, just forward of the trigger guard. With the cylinder open, the button is engaged and the entire cylinder, crane and ejector rod assembly are simply pulled forward and removed. The replacement cylinder is easily installed in the reverse order, and in seconds you're shooting .22 Magnums or Long Rifles, whichever. A quick adjustment of the rear sight is needed as the points of impact aren't going to be exact, but the inconvenience is minimal. The 992 is built on the same frame as the steel Tracker centerfire models (some Trackers revolvers are offered in titanium). The 992 also has the full-length ejector rod lug, giving the revolver some weight, particularly on my 6.5-inch test gun. The centerfire Tracker models are made with ports at the end of the barrel, which are absent on the 992, but the revolver does sport the full-length ventilated rib. The nine-shot cylinder is non-fluted. I like the 992's sights, the front sight being a fixed, ramp style with an orange insert. The rear sight is adjustable, with a deep notch outlined in white and a matte black finish on the face to cut down on glare. The sight is pinned in a slot in the topstrap, making it relatively low profile. A base that connects to the ventilations on the Tracker's barrel is available from Taurus if the shooter wishes to install a scope. The Tracker's grip is Taurus' Ribber, is a serrated rubber set of stocks. I've fired the .44 Magnum Tracker, which uses the same grips, along with the 922, and have found them to be quite comfortable and tacky, making it easy to get a solid hold. The 992 is available with either a blue or matte stainless finish. My test gun came in blue, which is a deep, almost black finish. The revolver's topstrap and the top of the ventilated rib bear a matte black finish in order to cut glare. I put the gun through some use in the field, and the finish seemed to hold up nicely. The Tracker's hammer is case-colored and features a wide, checkered spur for ease of cocking. The hammer also features a hex screw at the rear, which, when engaged, locks the hammer, cylinder and trigger as a safety feature. The 992 comes with the hex key with which to activate the safety. The Tracker's double-action trigger pull is a bit on the heavy side, but the weight and balance of the revolver makes up for the long pull. The single-action pull is good and crisp and weighed out at four pounds on my RCBS trigger pull scale. Right after receiving my sample 992 Tracker, I left for a hunt that would also offer a chance to shoot some prairie dogs, so I took the Tracker along. I was immediately impressed with the revolver and was successful at reducing the prairie dog population in the immediate vicinity. The 992's balance was perfect, and with the long barrel I was able to get an excellent sight picture. Sighting was quite easy with the orange insert on the front sight. Before long, one of my hunting partners got curious and wanted to shoot the Taurus and had a great time shooting at prairie dogs at distances out to a hundred yards or so. Both of us were pleased with the accuracy and balance of the revolver. During accuracy testing, I discovered that .22 LR ammo printed six inches lower than .22 Mag. at a distance of 25 yards. The 992 much preferred the .22 LR cylinder and ammunition over the .22 Mag. Since there was some deviation in the group sizes produced by the .22 Magnum loadings I used, it's likely that more experimentation could produce a more accurate load. Overall the 992's quick change cylinder concept is a great one. Switching cylinders/calibers is a snap, and once the shooter knows the number of clicks it takes to adjust the rear sight to compesnate, the change-out is simple. Smallest avg. .22 Mag. group: 33 gr. Remington AccuTip—3.9 in. Largest avg. .22 Mag. group: 40 gr. Federal Champion—4.1 in. Avg. of all .22 Mag ammo tested (3 types)—3.9 in. Smallest avg. .22 LR group: 32 gr. CCI Stinger—1.3 in. Largest avg. .22 LR group: 37 gr. Winchester Super-X—3.5 in. Avg. of all .22 LR ammo tested (3 types)—2.6 in. Notes: Accuracy results are averages of five-shot groups from a sandbag rest at 25 yards.